Life as Pink Einstein | Dallas Fashion and Lifestyle Blogger: Becoming a Blogger: The Basics! 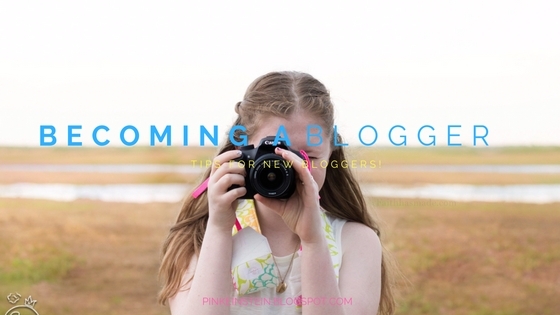 Becoming a Blogger: The Basics! Are you a new blogger or are you thinking of starting a blog? Well I have my top ten tips to starting a blog! 1. Take your own pictures: There are a few blogs that I have read where they don't take any of there own pictures so it can be hard to trust that they have actually tried out the product they are reviewing or made the DIY they are showing us and it can be hard to tell if a blog/website is trustworthy if everything is pulled from different sites on the internet. And it's a good idea to add at least one picture in every post. If you are talking about something like how excited you are for it to be the weekend and your plans for the weekend or something random like that I usually add a random picture that isn't going to make it in to a photo shoot blog post like a picture of a tree or a lady bug or something in nature that's still a good picture but not one that people would want to see a whole photo shoot of. 2. Make your blog look homie: Make your blog feel like you just stepped through the door of grandma's house. People should be comfortable with scrolling through your blog they shouldn't be scared some weird ad is going to pop up and give your computer a virus. Make everything easy to find on your blog. This one kind of ties into the last; if your blog isn't appealing and looks weird no one will want to read it. It's kind of like that creepy house at the end of your block that no one wants to pass because a monster could potentially jump out and eat you; if your blog doesn't look homie and trustworthy like a place you would like to visit no one will like to visit it because they could feel it's a virus or scam. 3. Figure out what you are going to blog about. A lot of people say you need to figure out what one thing you are going to blog about and stick with it but I have a ton of hobbies so finding one topic to blog about is hard so I do a little bit of everything which is okay. If you are going to blog about a lot of different things make sure you have a good ratio of the different topics. For example, don't have a majority fashion posts and then one or two random ones, keep it consistent. Do a photo shoot then a fashion post then maybe a life hack post and then a DIY. The best thing to do is to try not to post about the same topic for multiple posts in a row, mix it up a little bit. 4. Have personality! In every post I try to give the story behind how I came up with the post or what was going on while I was taking the pictures in an introduction paragraph. If you are writing a blog about you, you need to include your life in it. It's always more fun to read when you know things about the person writing. 5. Have an about me page. As I said above it is more fun to read when you know about the person writing the blog. I have an about me page with a pretty decent paragraph about how I got my name, my hobbies, and anything extra I wanted the readers to know. I'm not allowed to show my face so I had my cousin take a picture of me behind the camera so you can get an idea of what I kind of look like and it also tells the reader I'm into photography. If you don't want to show your face you can get creative with a profile picture by drawing yourself, taking a cool picture from behind, or even a picture of your feet in your favorite shoes. 6. Have fun! If you are creating a blog just to become famous I promise you it won't work. I have had my blog for a few years now and I am just now starting to get a good amount of readers. And if you feel that your blog is a chore then blogging is not for you. Don't ever feel that you have to post or if you are on vacation and you wanted to post on a certain day it can wait, we are all humans and we don't always get to post when we want. If you start a blog and later feel you have writers block then take a couple months break until you are feeling the blogging vibe again. 7. Use social media. You don't need an account on every social media but I would recommend having at least one. I have an Instagram where I post about new blog posts and I post other fun pictures that aren't blog worthy. Pinterest is a good social media to have because you can advertise your blog posts for free just by pinning a picture from your blog. I also have a YouTube channel where I post videos and at the end of my videos I mention my blog. 8. Use labels. I don't know if you can do this on any other blog site but on blogger you can add labels so people can see everything else you have written in that category. You can find my labels at the very bottom of my posts. Some of the labels I add on my blog include God, Summer 2016, Beauty, Fashion, Photography and more. If you have a series on your blog I would put the title of your series as a label so that people can find and read all of that series posts. 9. Polls and followers. Polls are a great thing to add to your blog to see what your readers would like to see more of on your blog or the things they are interested in so you can make sure to include those things in some of your posts. It's good to put a follow button on your blog so people can follow by email and get an email when you post or can follow with their Gmail account and see it on their blogger home page. Obviously not everyone who reads is going to follow because some may not have a Gmail account or they don't want to get emails which is okay. 10. Plan Ahead. With my blog I am trying to be consistent with when I post but I don't have a set posting day because my schedule is so busy. My cousin posts on her blog every Thursday so if you have a day of the week when you are never busy then that would be a great day to post. Since I am so busy, lately I have been posting every three days. If you have a planner for school like I do, you can write in it or if you want to invest in one, write in there when you want to blog or when something is scheduled to go up. The schedule button on blogger is a great tool to use. When I am with my dad I'm not as crazy busy as I am at my mom's house so I have a little bit more time to blog so I will write a few blog posts on a Saturday morning and schedule for them to go up later in the week when I have no time to even think about my blog. You can also have a series on a certain day of the week like I do. My series is Makeup Monday which is kind of self explanatory but every Monday I do a review, an opening, or tutorial using makeup and beauty products. 11. Comment on other blogs. Don't expect people to find out about you right away. Go comment on peoples posts giving feedback or answering the questions they ask in their post but DO NOT leave a comment that just asks for them to check out your blog, it's rude and it makes people mad. At the bottom of your comment you can leave your blog link. Those are all of my tips for today! Even though I said above not to leave a comment for people to check out your blog, I want you to leave your blog link so we can all check each other's blogs out!